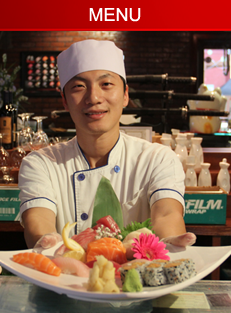 Fuji Grill II offers a vast menu of sushi, cooked entrees, lunch specials and beverages. Click the links below to access specific menus. Soups, salads and kitchen starters. Sushi and sashimi starters, entress and individual pieces. Japanese entrees cooked to perfection including teriyaki and tempura dishes. Classic, vegetable, fish and spicy rolls or hand rolls made fresh. Fuji Grill III's unique and special rolls. Lunch specials including sushi, rolls, sushi combos, lunch box and entrees. A selection of domestic and imported wines and beers, all chosen to complement sushi and traditional Japanese cuisine.